and the mind unsettles in. Given its exploration and adherence to geographical space, as well as a cadence of the poetic, meditative lyric, To Keep Time connects in intriguing ways to numerous other titles I’ve seen produced by Omnidawn throughout the past few years, including Karla Kelsey’s A Conjoined Book (2014) [see my review of such here], Robin Clarke’s Lines the Quarry (Omnidawn, 2013) [see my review of such here] and Brian Teare’s Companion Grasses (Omnidawn, 2013) [see my review of such here]. 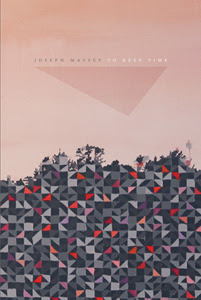 Also, part of what what appeals about the poems in this collection is Massey’s sense of pacing, articulating a sequence of short phrase-lines and line breaks, akin to Robert Creeley or Rae Armantrout, that pause and break and breathe, inching along in one direction while maneuvering outward into multiple others. These are poems that deserve quiet attention, and can move deceptively fast, highlighting turns and curves at breakneck speed. The space and feeling of geography that Massey maps here is intimate, and deep, sketching small moments even as they fracture, diminish and dissolve. Even as he keeps time, he writes with the awareness that it can’t be held, not even within the space of a poem. a world, but it isn’t. My first book, Areas of Fog, was more or less a collection of all of my chapbooks up to that point, with the exception of one (Eureka Slough). Once the book came out I felt like a space was cleared — I felt free to get to work on other things — so it changed my life in that respect. With all of those out of print and often very delicate chapbooks reprinted in a single volume, I was able to really look at what I had done. The book provided a beginning. What’s unfolded since then revolves around the same concerns — attention to immediate details of the daily surroundings, the actual backyard and the universal backyard, the seams and fractures between natural worlds and human intrusion, and perception itself — but lately there’s a gradual drift inward, something (I almost hate to say it) personal coming into the work. I think that can be heard in the book that’s coming out in the fall, To Keep Time, from Omnidawn. After having composed a single project for so long, does the idea of what comes next become complicated, or as a relief?